We are looking forward to the Dirty Dancing Festival in Lake Lure this coming weekend, August 15th. It has become a tradition in Lake Lure since 2010. The year after Patrick Swayze’s death, it was decided that the town would honor the star and the movie with a festival that would raise money for pancreatic cancer research. It has been a draw for Dirty Dancing fans ever since. As one of the major sites of the filming, Lake Lure is the perfect venue. We bought our small cottage on the lake in 1984. Little did I realize that in the Fall of 1986, Patrick Swayze, Jennifer Grey and the cast and crew were in residence at the Lake Lure Inn filming scenes around the lake. At that time it was a low budget film. No one had ever heard of Patrick Swayze or Jennifer Grey. Lake Lure was not the only film location. Parts of the movie were also filmed in Virginia. I wrote a post about our stay at Mountain Lake, Virginia and the confusion about the scene where Baby was put in the corner. I thought it was in Virginia and sat at that corner table, but as it turned out, it was really in Lake Lure. Many of the scenes were filmed in Lake Lure. To teach Baby how to master the move of being held in the air after leaping from the stage, Johnny suggested that they practice in the water. The “lake lift” has become an iconic move. From what I have heard, because it was late autumn, Patrick and Jennifer were very cold in the frigid water. A big part of the festival today is a contest to see which couple can perform the best lift. The above couple did very well. This couple did their best. . . . . the picture makes me smile and laugh. These are two of our guests who rented our small cottage for two weeks a few years ago. 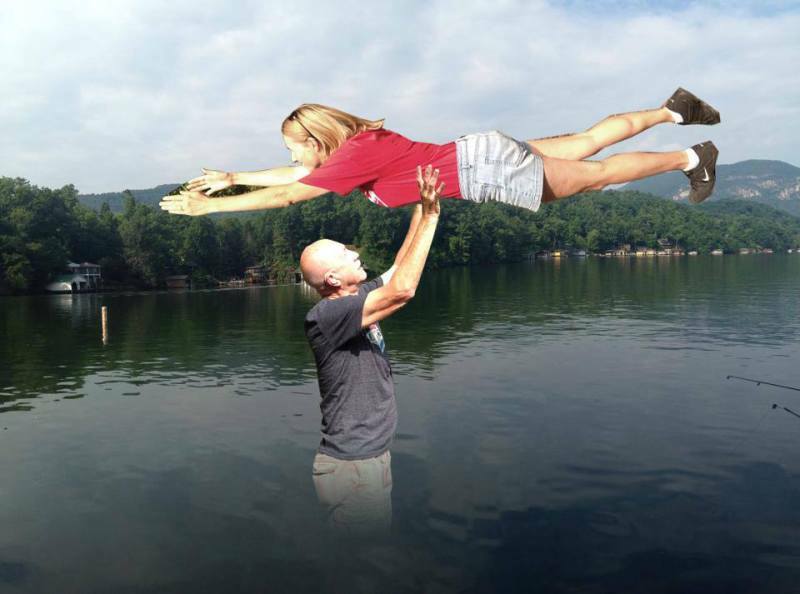 Jenel is very talented on the computer and photoshopped a very convincing recreation of the lift. She offered to do one of David and me, but I wasn’t too sure that it would be a pretty picture. Maybe after we are toned and buff. Ha! But I totally love their picture! We are still trying to eat well. 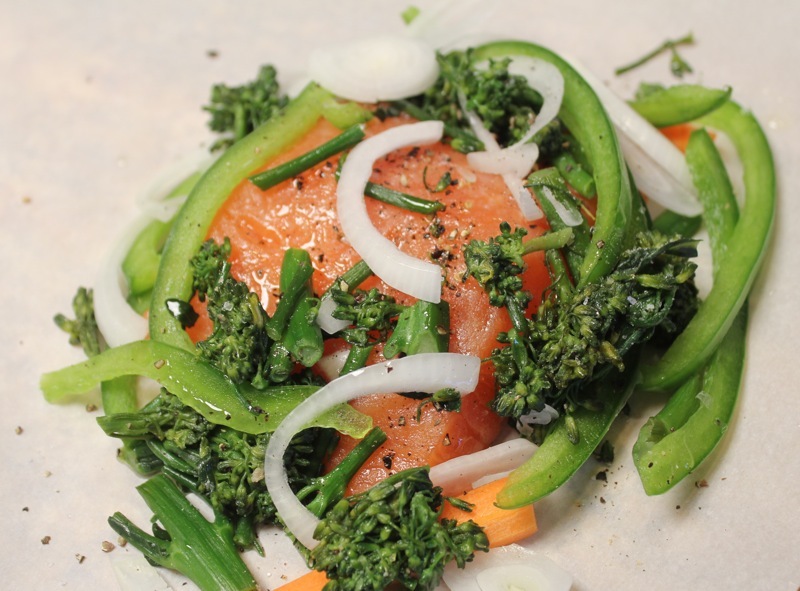 I have posted about this recipe for salmon in parchment before, but thought it was worth a repeat. It is one of David’s favorite creations. You can see the details for the dish here. One of the things I love about it, other than the taste, is that you can make the parchment packages ahead of time and just bake them when you are ready. They would be perfect for camping wrapped in foil rather than parchment paper. Or after an afternoon attending a festival. Enjoy your weekend. “Have the Time of your Life”. Posted on August 13, 2015 at 7:33 am. We are on a short trip in Northern Georgia. 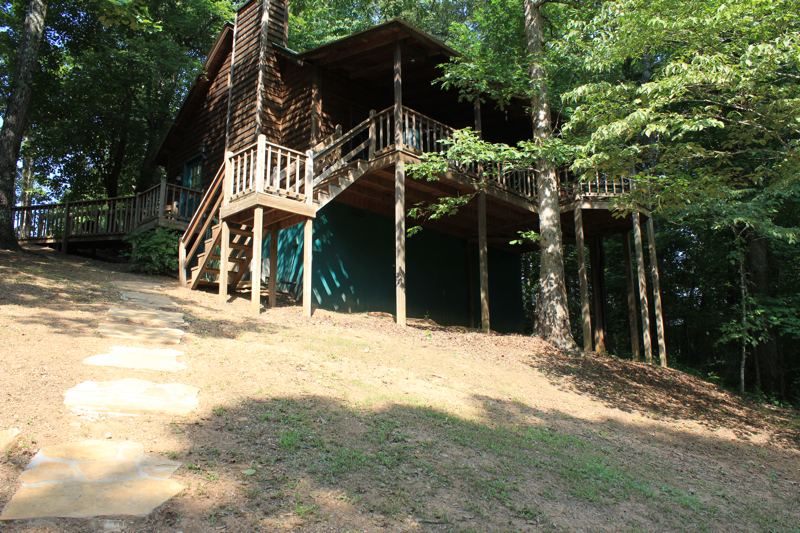 I wanted to find a cabin in the woods away from everything so that we could totally relax for a few days. David wanted to try his hand at fly fishing. Trout Fishing in America is the name of a book by Richard Brautigan written in the 1960’s that became a cult classic for a generation of young people. We still have our copy on the bookshelf. The book had very little to do with trout fishing. But I liked Trout Fishing in America as the title to this post because it has everything to do with trout fishing. 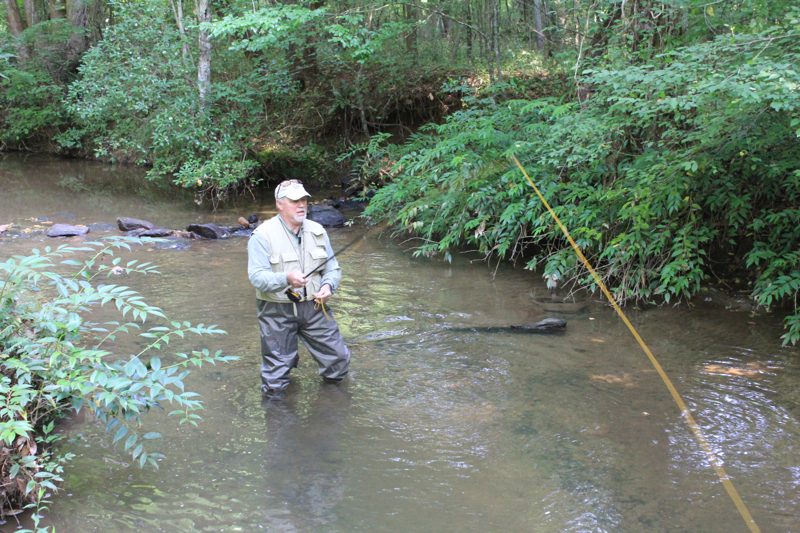 We have trout streams all around us in North Carolina, but David has only fished them once or twice. 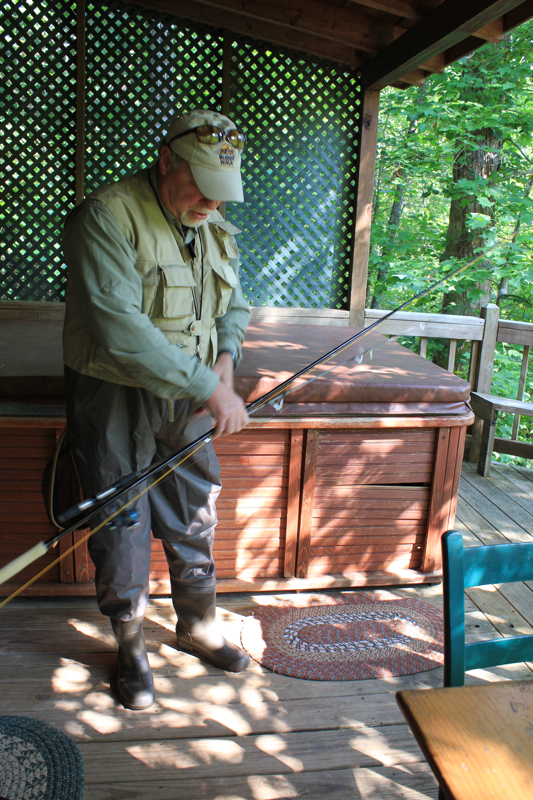 Since the cabin we rented was on a trout stream, he decided to gear up and give it a try. This trip was supposed to be about complete relaxation after all. Notice the hot tub in the background. The stream is below the cabin. We loved listening to it, but it was not the best stream for fishing. It was too small. 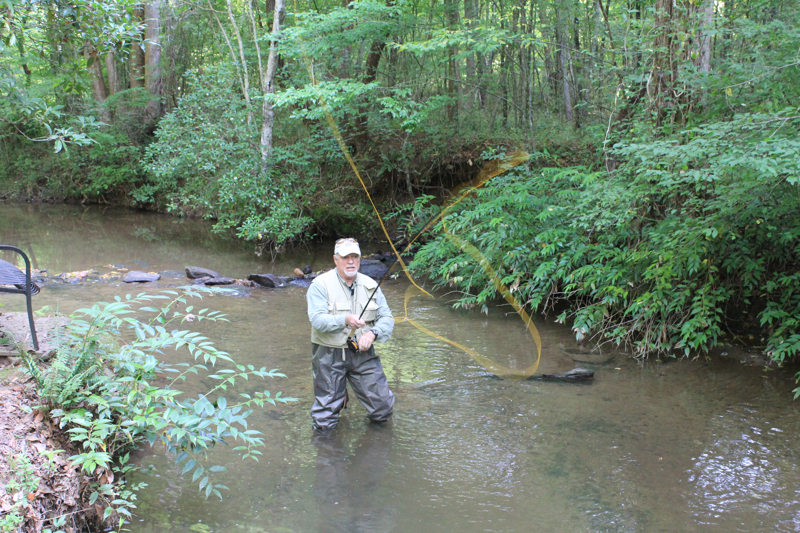 David was able to find better fishing on a larger stream. Unfortunately he had no better luck there. But never fear. He retreated to Betty’s store in Helen, Georgia and came home with these beautiful dressed trout. I seasoned them inside and out and put lemons and bacon around the outsides. The recipe came from Nancy Fuller from the Food Network. I need to offer a word here about renting get-away cabins. It is always wise to bring your own skillet and knives. Unfortunately I did not follow my own advise this time. There was not one skillet in the cabin big enough to cook the fish, let alone bacon and eggs for breakfast. The skillets that were here were small and useless. I tried to fry our eggs one morning and I defy anyone to make an over easy egg in what I had to work with. The knives were a joke. And did I mention the can openers that did not work? What I can’t understand is how this cottage has not addressed these issues. Surely someone before me has complained. Doesn’t anyone cook anymore? But in spite of my handicaps, I managed to put some really good trout on the table. I think I worked harder on this dish than David did trying to catch it. By the way, he loved it. It was a really good trout recipe that may need some tweaking. My bacon was not totally crisp the way I like it. 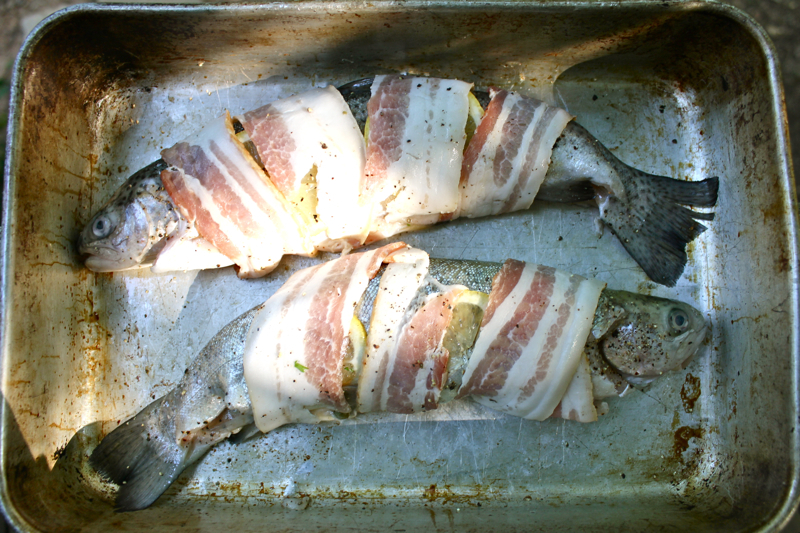 I think it would be good to cook the bacon briefly before wrapping it around the trout, although you want it to be still pliable. The seasoning on the inside of the trout was spot-on. I am hoping that when I am home and have better cooking equipment, I will make this trout even better. We are off to The Montaluce Winery in North Georgia on my next post. Now it is my turn to indulge. Sprinkle the inside and outside of the trout with salt and pepper. 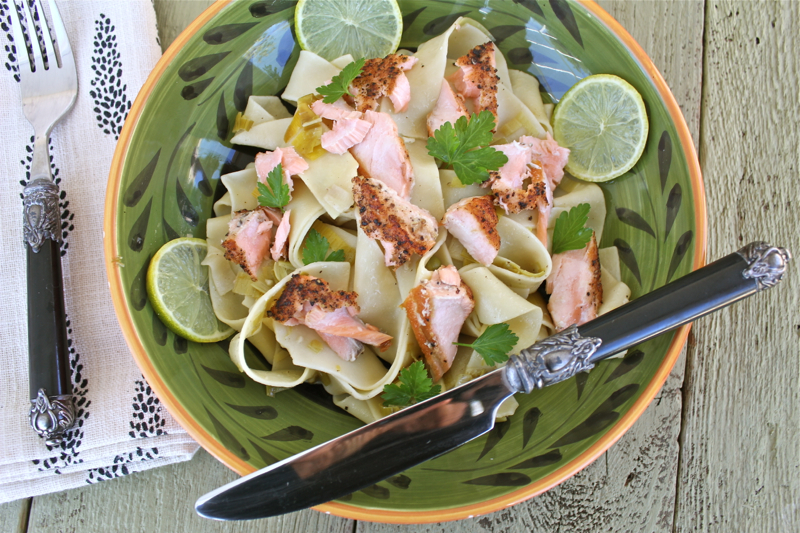 Combine 1 tablespoon of the olive oil, the herbs, capers, garlic, lemon juice and some salt and pepper in a small bowl and divide the mixture between the two trout. 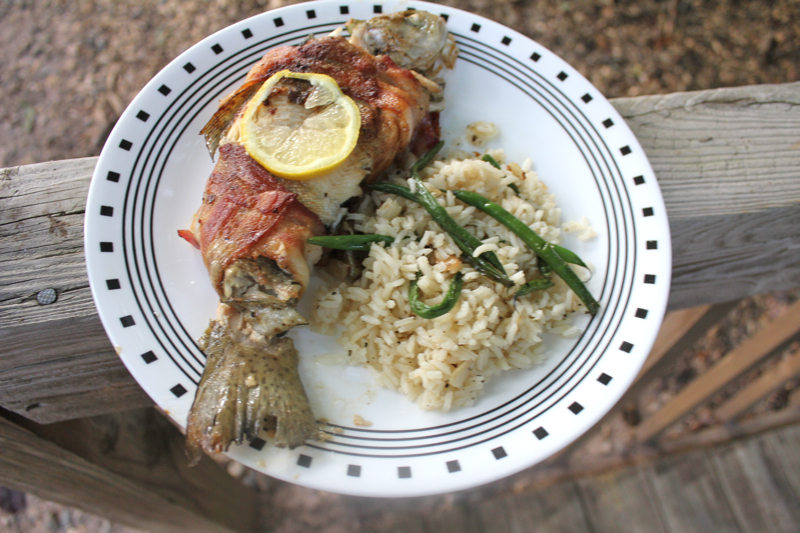 Fold the trout back onto themselves, lay 2 lemon slices on top of each fish, and then wrap each trout with 2 slices of bacon holding the lemons in place. Heat a large cast-iron skillet over medium-high heat and coat lightly with the remaining tablespoon olive oil. Place the trout, lemon-side up, in the pan and cook for 3 minutes, then place in the oven. Roast, flipping halfway through roasting to ensure the bacon is crisp, for 20 to 25 minutes. Posted on August 7, 2014 at 8:51 pm. Sometimes less is more. With just 5 ingredients I was able to make a delicious dinner. To be quite honest with you, I have not been inspired to cook lately. It may be because of two solid weeks of cooking for a crowd. But I also think it was because of the weather. We were blessed with two weeks of near perfect weather for the first half of the month. But when all of our company left, the skies opened up and rain started to fall for days on end. When it wasn’t drizzling, it was just plain gloomy. You can tell by the quality of my last post pictures. Why bother making blog worthy food when it won’t photograph well. Just goes to show you how sick we food bloggers really are. Well, the skies cleared yesterday afternoon and I was suddenly in the mood to cook, photograph and eat good food again. 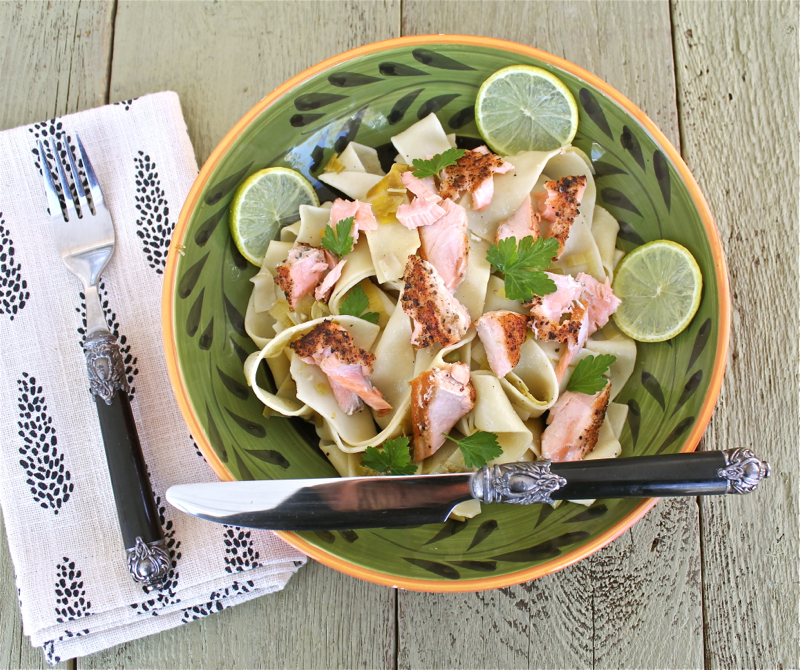 This salmon dish has only three ingredients; salmon, peach preserves and Sriracha hot chili sauce. The simple rice is enhanced with grilled scallions. That’s it! I made it in my grill pan because our gas grill was out of gas. I’m sure it would be even better cooked outside. 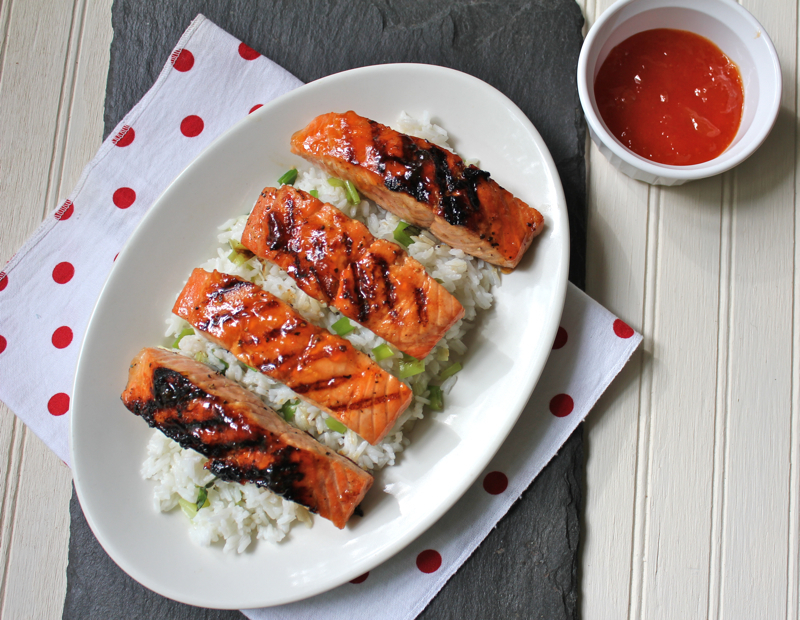 The peach preserves and Sriracha sauce gave a sweet and spicy kick to the salmon. I will definitely be making this again. It is nice to have my enthusiasm back. I think I will make a cherry-almond tart today. Heat grill to medium in one zone and medium-low in another. To make glaze: In a heatproof dish, microwave preserves until just warmed, 10 to 15 seconds. Stir in chile sauce. Transfer all but 3 tablespoons of mixture to a small dish and set aside to serve at the table. 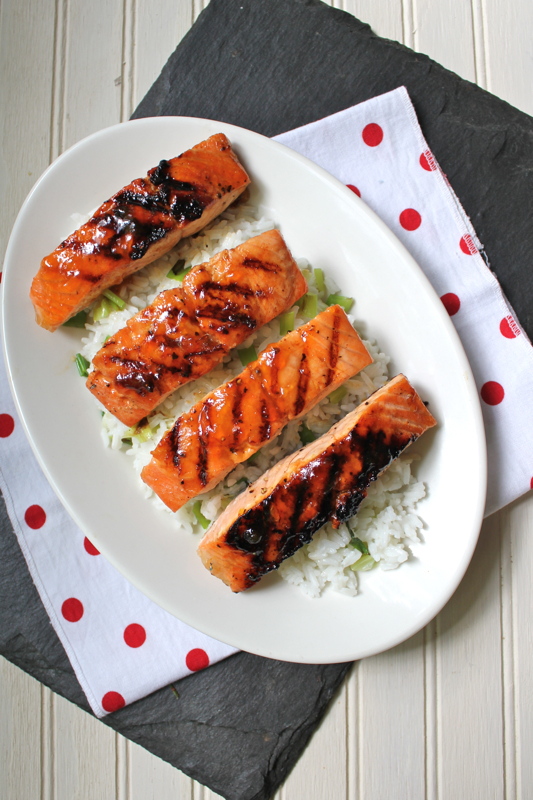 Season salmon fillets with salt. Grill fillts, skin side down, on medium heat zone for about 10 minutes. Meanwhile, grill green onions on medium-low zone until sear marks appear, about 3 minutes. Remove onions, chop, and stir into rice; set aside and keep warm. Brush fillets with some of reserved peach glaze using a metal spatula, flip each piece. Continue to grill until flesh is cooked, 2 to 3 more minutes. Remove and brush with more glaze. 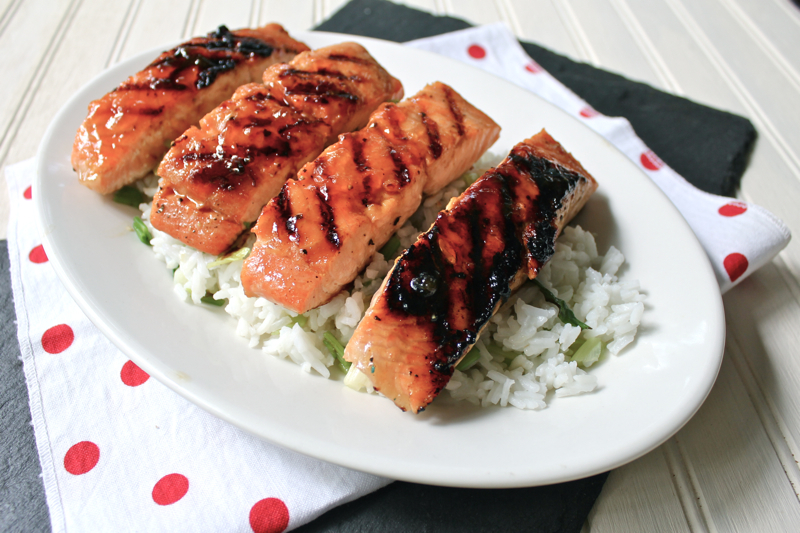 serve salmon over rice and with dish of reserved glaze. Posted on July 23, 2014 at 9:41 am. After two weeks with company, we are on our own again. The house feels empty. I am missing the chaos and children’s laughter and even the shrieks of discontent. But the house is back in order and the refrigerator looks less like a dumping ground for a crowd with disparate appetites. At one time we had 5 different kinds of milk; soy milk, almond milk, whole milk, 2% milk and skim milk. I have reclaimed my computer from my 3 year old Grandson. 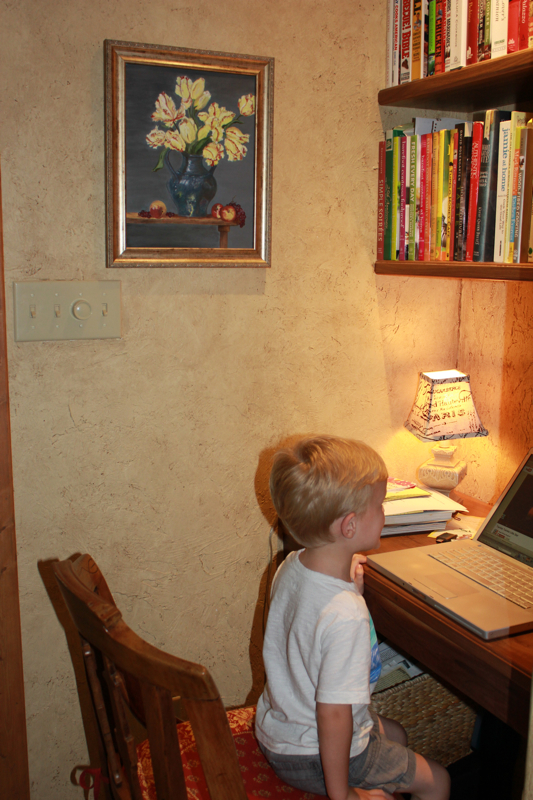 He loves watching You tube videos of Thomas the Train. 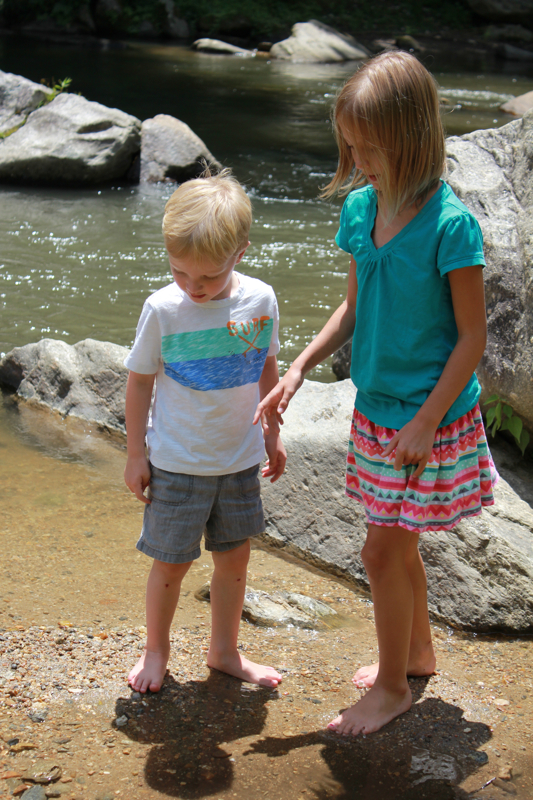 We took the Grandkids to the Rocky Broad River one day to play and splash in the water. So now we are back to meals for two. 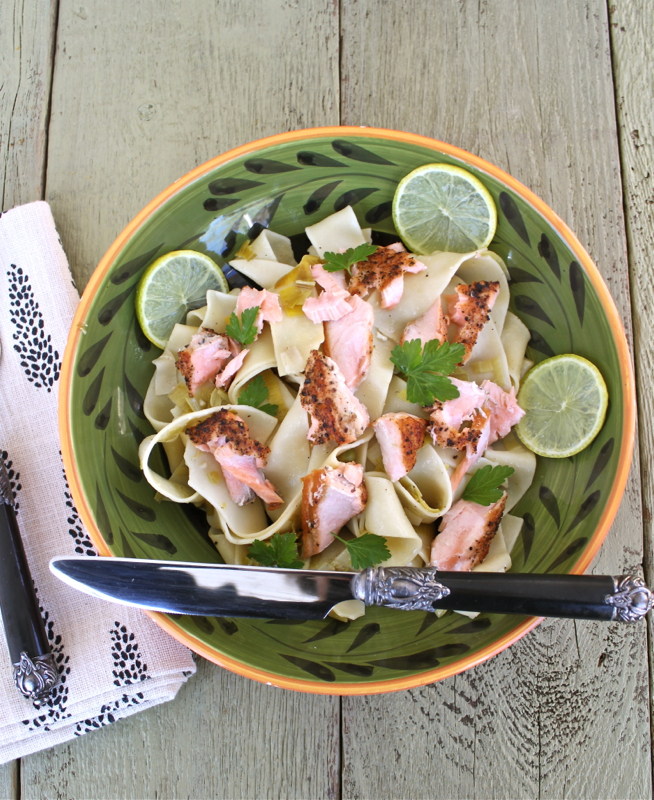 This recipe for Tilapia with Lemon Vinaigrette is one of our favorites. It is a Giada De Laurentiis recipe and we have been making it for several years now. It is always a collaborative effort. 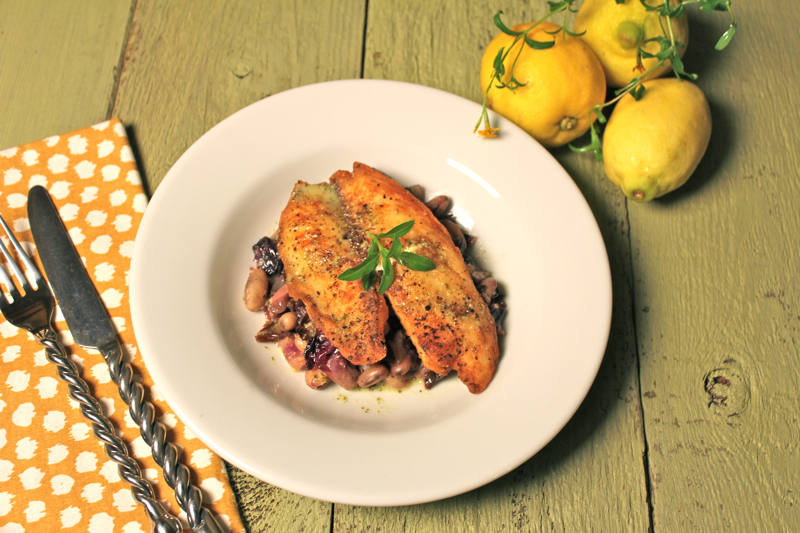 I make the lemon vinaigrette and white beans and radicchio and David pan fries the fish. It comes together in a flash. 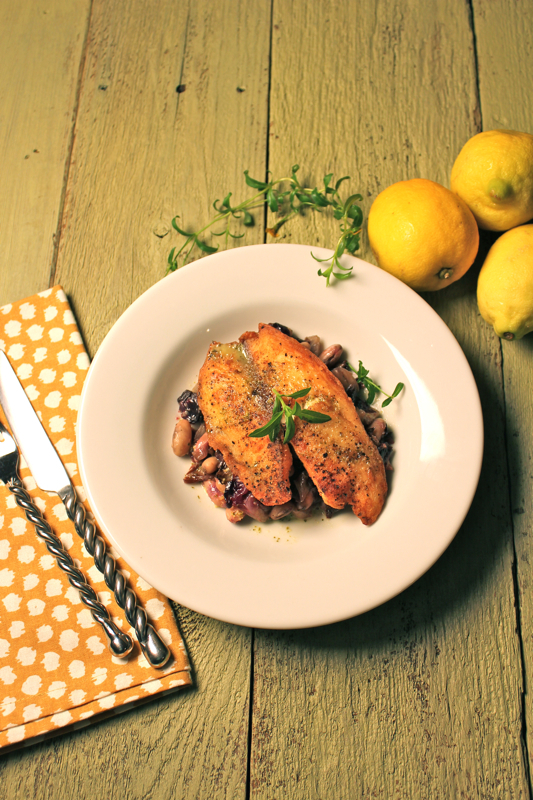 The vinaigrette is perfect with the fish and the combination of white beans and radicchio is a stellar accompaniment. The bitterness of the radicchio is tempered both by sauteing and by being mixed with the mellow cannellini beans. It is a simple dish with lots of flavor. Heat 2 tablespoons of oil in a heavy large skillet over medium heat. Add the shallots and saute until tender, about 2 minutes. Add the radicchio and saute until wilted, about 5 minutes. Add the beans and broth and cook until the beans are heated through, stirring often, about 5 minutes. Season the radicchio mixture, to taste with salt and pepper. Blend the lemon juice, parsley, tarragon, garlic, lemon zest, salt, and pepper in a blender or food processor. With the machine running, gradually blend in the oil Season the vinaigrette, to taste, with more salt and pepper. Posted on July 19, 2014 at 7:40 pm.